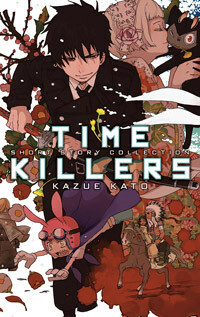 Viz Media is announcing that the company is releasing Kazue Kato’s Time Killers manga story collection on September 2, 2014. The single-volume standalone collection of manga shorts from the creator of the Blue Exorcist manga series will be published under the Shonen Jump imprint, is rated ‘T+’ for Older Teens, and will carry an MSRP of $14.99 U.S. / $17.99 CAN. Time Killers also features 13 pages of full-color artwork as well as a fold-out, full-color gatefold poster. Included in this collection is Boku to Usagi (Me and the Rabbit), as well as the stories and character designs that would become her breakthrough series, Blue Exorcist.